Bit of halter training this evening made a nice change from kitchen stuff. The boys are off to their new home soon - they will be missed but it is time for them to go! 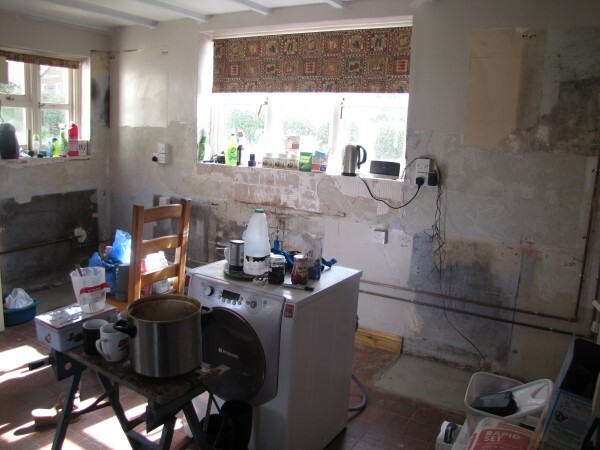 The kitchen is proving to be a mammoth operation and we have now reached the stage of no sink, no washing machine, no work surface - so it is salad followed by salad and it is not really the weather for it! When it is done it will be lovely! The weekend saw a bit of an epic change for a little group of older girls. They are a few we will not be breeding from again but I wanted them to still have a role to play and so they have become sheep nanny's. This is a role they appear to love. 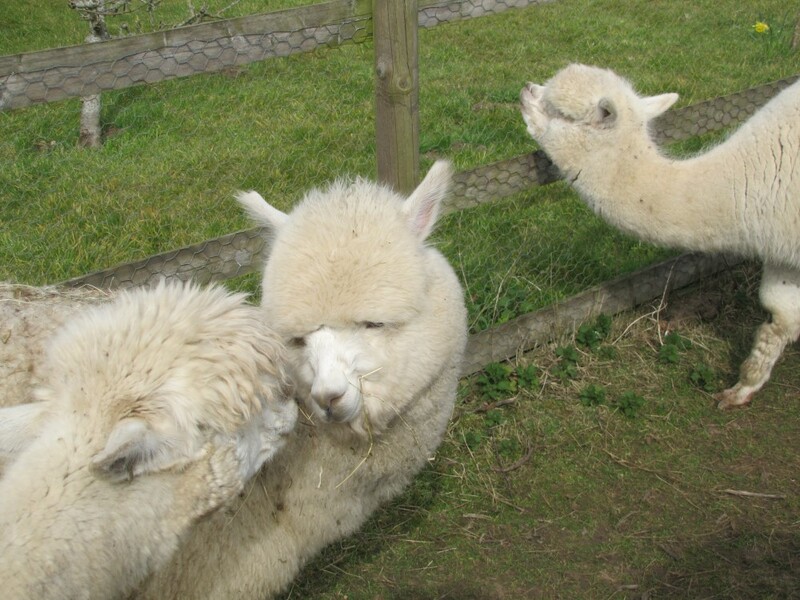 One of them is Sam's alpaca, Sapphire, and she is over the moon about her new role! 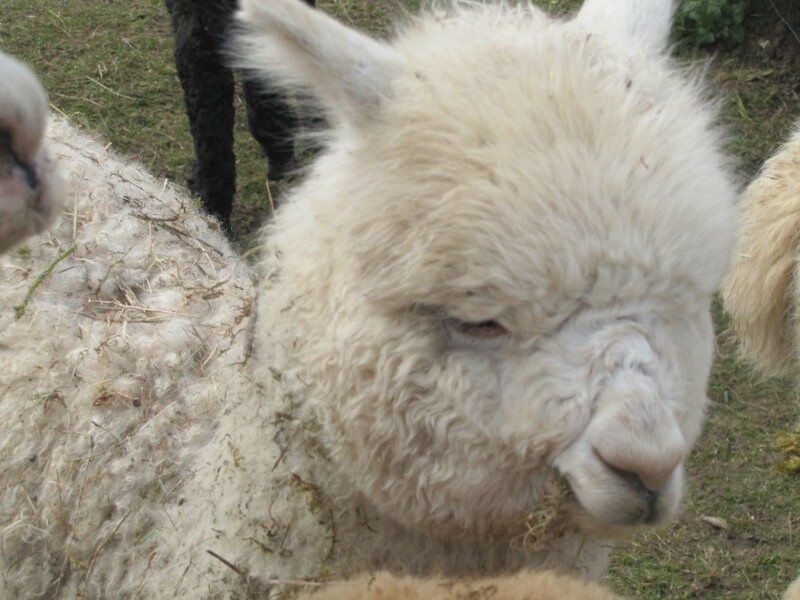 She is not normally an excitable alpaca but she was on Sunday! 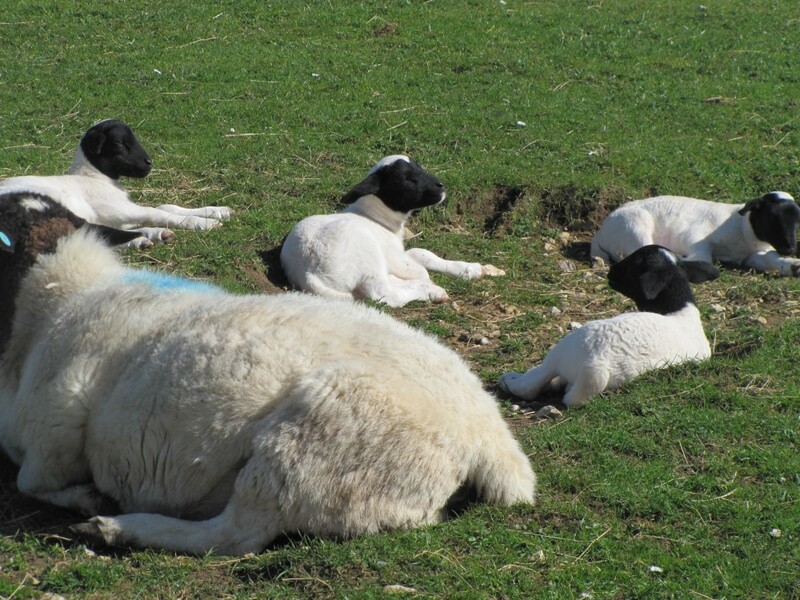 There is a bank in the 10 acre field they are now in with the ewes and lambs and in the evenings the lambs love to bounce, charge and race all over the bank - Sapphire joined in!! She pronked, she leapt, she charged! Gangs of little lambs joined her and it was a site I wish I could have recorded. 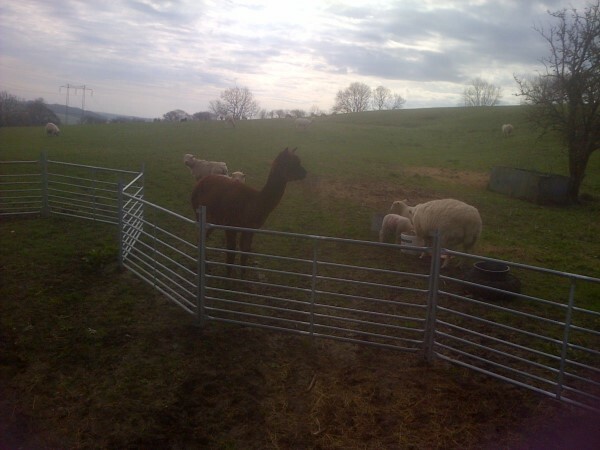 The other alpacas with her are also very sprightly and constantly on look out so hopefully they will keep all the lambs safe. Dire photo I am afraid! 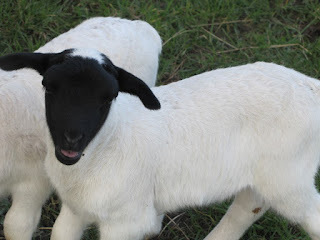 Now Judi told me to slow down a bit and so I have - I spent ages today watching the little Dorpers, who remind me of dalmations! 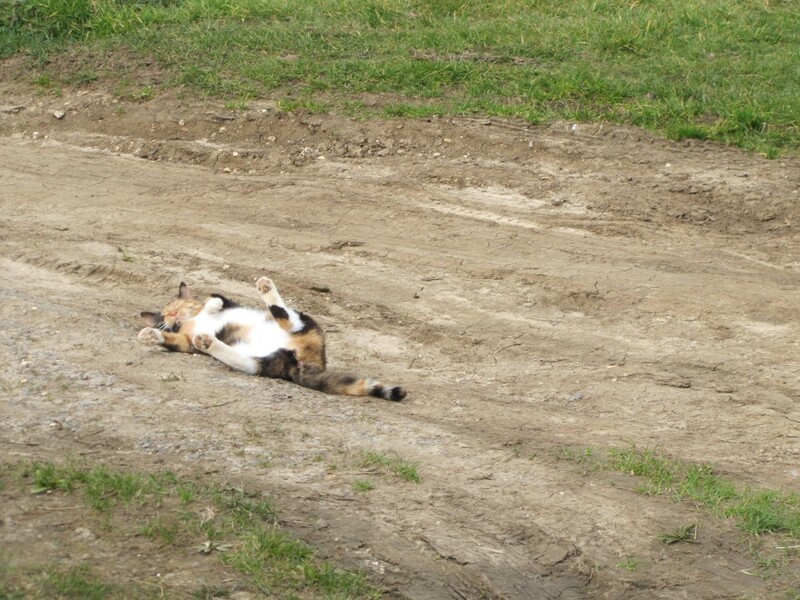 Well - that is enough resting! Two little boys to get ready to go to their new home and a drive to dig up! Feels very cold at the moment and I am still in several jumpers for most of the time. 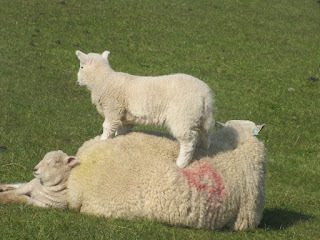 Lambing is almost over - just two hanging on until the bitter end. 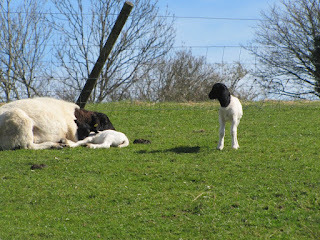 Lots of lovely lambs jumping about - love the little Dorpers! 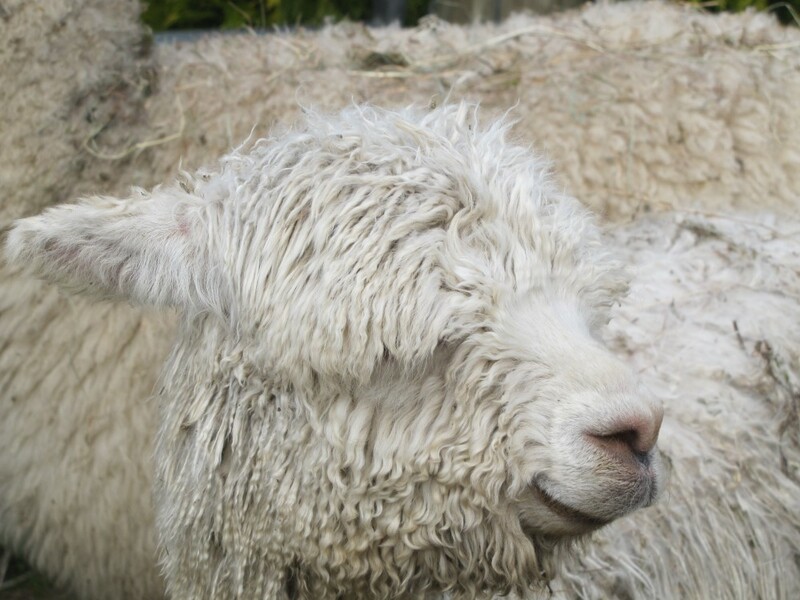 We are off to market tomorrow and then it is a rush back to move sheep and check over a sold alpaca ready for delivery next week. 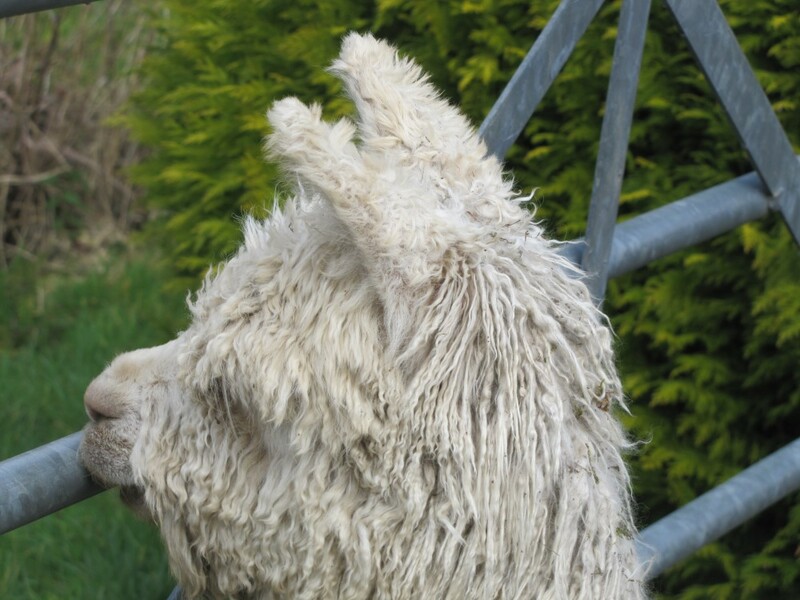 Off to Wales tomorrow to deliver four alpacas so today has been a dash round to check everybody is well sorted so there isn't too much to do in the morning. 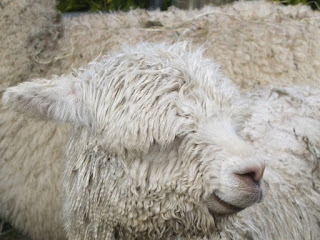 We shall be getting back as quickly as possible though as my Dorper Sheep are due next week. In fact, next week is looking busy already as I have to arrange another pre movement Tb test for another sold boy. Little ones are all growing well but the two young lads haven't yet found a home - hopefully, they will do soon! 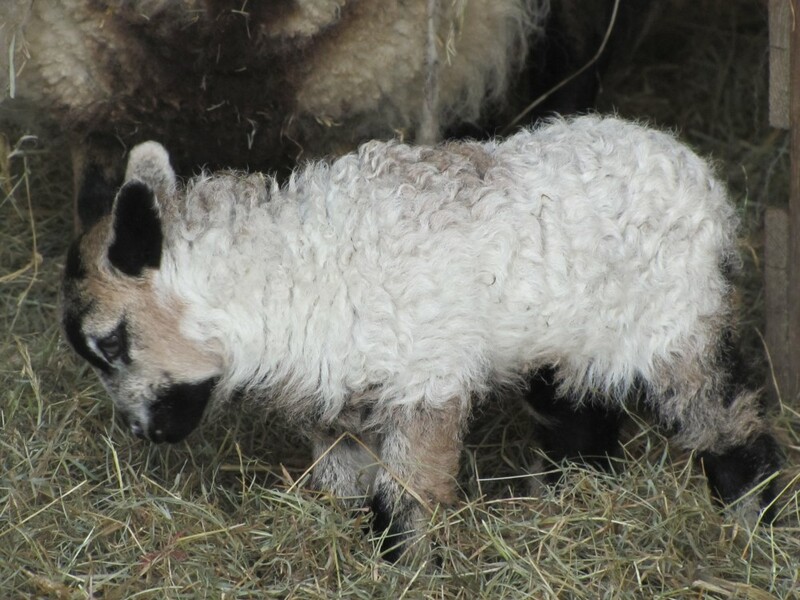 And little Flossie is just gorgeous! 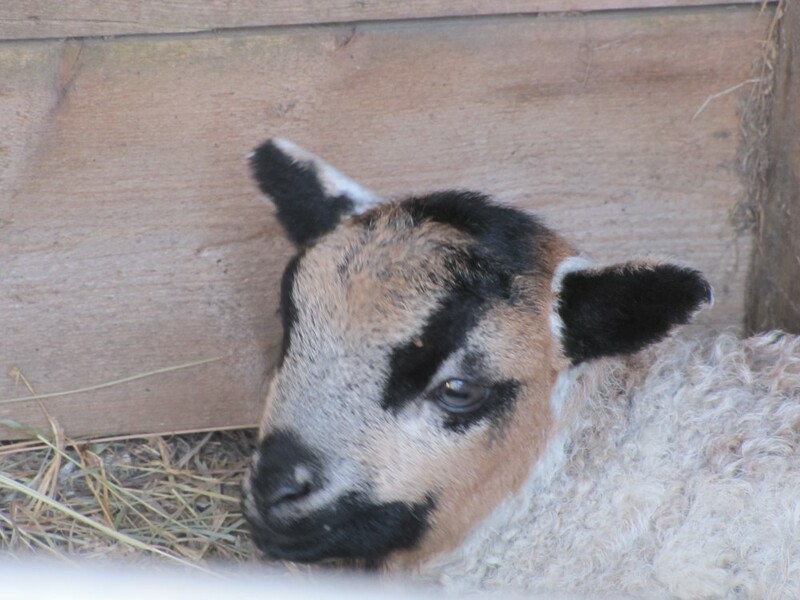 And the lambs are growing up and playing like crazy - all very exciting! Too many exclamation marks as usual. A bit of sun - camera comes out! Bit of sun today which was very good for the lambs but it looks like rain is on the way. Thought I would get a few alpaca photos in before the rain arrived. And one of the cat who is supposed to be a stray but has taken up residence! 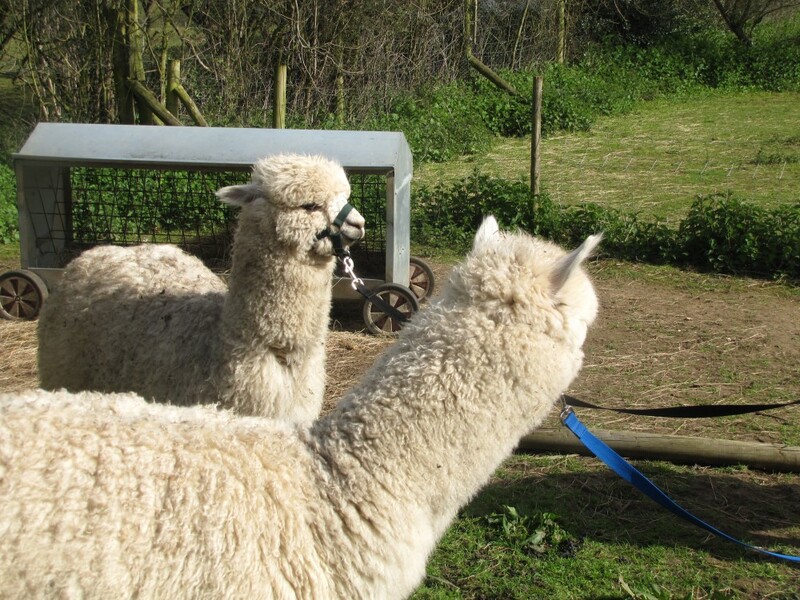 Yesterday was pre movement Tb testing on four sold alpacas - hopefully, on their way to a lovely new home very soon. I got home afterwards to a message that another sale was confirmed so that is another to test! My car is jinxed - now it appears to have a tyre problem (thank you GHN for spotting that). 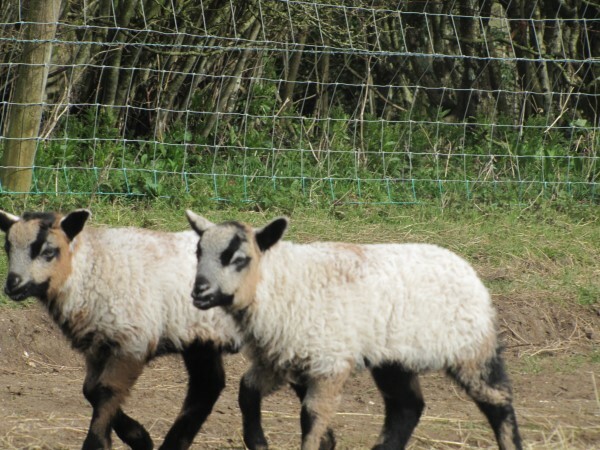 Regardless, we soldier on and last night I acquired a few little badgers - - the sheep variety! 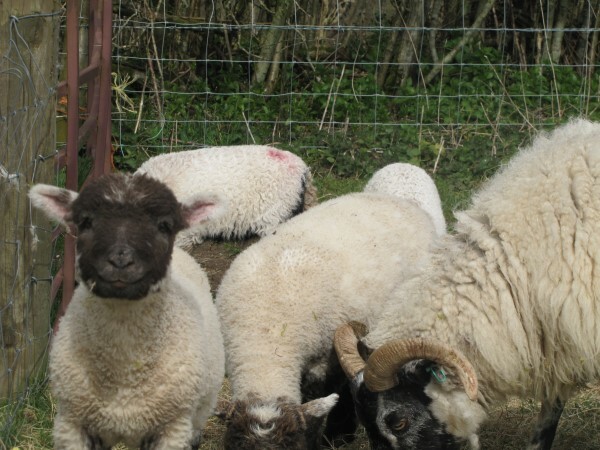 Lambs are all growing up - some of the Southdown crosses look like little old men! The sun coming out has made life far easier - hopefully, no rain for a while, and things will dry out! Despite not mentioning them, things have not been quiet on the alpaca front and four should be going to a lovely new home very soon - more on that another time as now I must whip off and check for new lambs! Sorry, this is not really alpaca or sheep related! 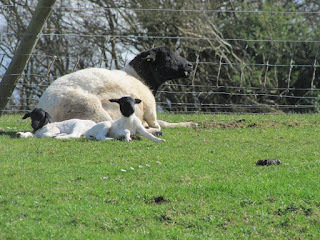 Lambing continues - nearing the end now although I do have the 4 Dorpers at the beginning of April. Alpacas are ticking along nicely - they have had two visitors in the last week, something Trouble enjoys immensely. Real subject of this blog, though, is cars - my car to be more precise! 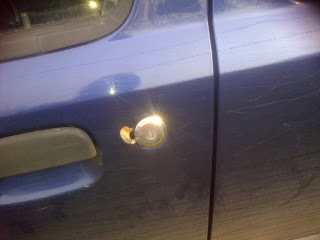 Eight days ago - a day etched in my mind - my shopping was stolen from my car whilst parked at the field. This made me hopping mad but I blamed myself as I was carrying a sick lamb and various other bits so locked the car but did not check the boot and the central locking can be erratic. I assumed it was my fault and the boot had bee unlocked as they had obviously got in through the boot. 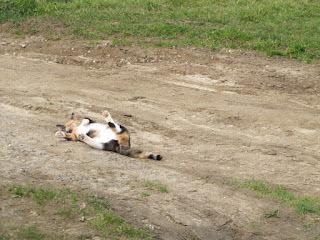 They had left a £400 camera on the floor in the front and, incidentally, a £10 note in the side pocket - I think I disturbed them coming up the track as I did hear someone whistle. Anyway, cross as I was, I blamed myself. Well - today Carl went to get something from my car and this is what he sported on the passenger door - Eight days ago and I had not noticed it! It wasn't my fault!! They had taken a screwdriver or some such and made a hole which enabled them to open the locked boot. Now I need a new door! !